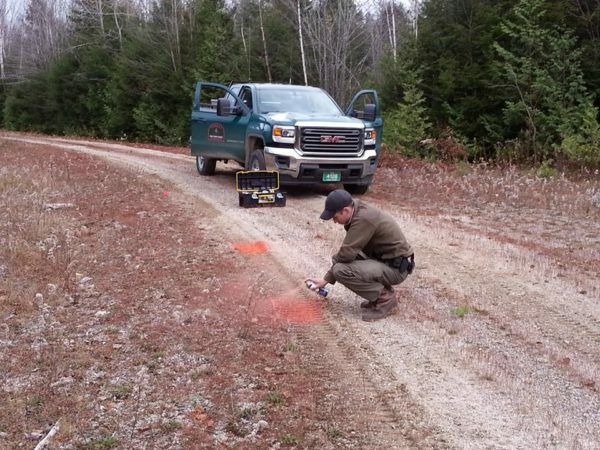 A Maine Forest Ranger collects evidence on a property abuse case in October 2014. AUGUSTA, Maine — After years of debate, a proposal to arm Maine’s forest rangers on the job had a breakthrough moment Thursday with a 132-15 vote of support from the House of Representatives. This year’s bill, sponsored by Rep. William Tuell, R-East Machias, addresses the training aspect by calling for the Maine Criminal Justice Academy to establish certification standards and a training program for forest rangers and for all rangers to be trained by July 1, 2018. However, funding could prove to be the bill’s undoing. The bill’s fiscal note calls for more than $150,000 in state spending during the next four years for the purchase of firearms, ammunition, holsters and lockboxes. The Department of Agriculture, Conservation and Forestry also has said that it will have to reclassify the positions of its approximately 50 rangers, at a cost of nearly $9,900 each for a potential cost of approximately $500,000. There could also be costs associated with developing an ongoing training program for rangers. In 2016, a bill to arm rangers ended in a compromise that equipped them with ballistic vests, but not firearms. Rep. Beth Turner, R-Burlington, said rangers should be armed because they are often first responders to crime scenes in rural Maine. “We need these rangers for our protection, especially in rural Maine because they are usually the first ones on the scene of a crime,” Turner said. Rep. Thomas Skolfield, R-Weld, said rangers should not be required to participate in violent altercations. “If they find themselves in situations like this, they should have the training and expertise to extricate themselves from that situation,” said Skolfield, who said there is no record of a Maine forest ranger ever being in a life-threatening situation with a suspect. Rep. Lois Reckitt, D-South Portland, said she rarely votes for any bill that supports increasing access to guns, but she voted for this one. “I am standing up for these folks who in my mind are another segment of the law enforcement community in Maine,” she said. The Maine Bureau of Forestry and the Maine Forest Products Council testified against the bill during the committee process in January, but that was before substantial amendments were made. “This bill would pose significant liability risks both for the state and the forest rangers,” said Doug Denico, director of the Bureau of Forestry.